From categories: All categories General Discussions: General Discussions General Discussions: Help! Under: The Internet Bible Catalog » List of English Translations » Douay Rheims » Irish Bible Editions 19th Century » Reprints Of The Simms M'Intyre 24mo. I thought someone might be interested to know that there are "Non-London" imprint reprints, which is what I have. It is a 1840 Belfast imprint exactly like the first edition title page, but with the date 1840, not 1839. The reason I thought someone might like to see it, was that I checked myself before buying the edition I now have, and supposed it would have the London imprint, but was very happy to discover it had only the Belfast imprint. So my question is, assuming I am allowed to add this info, how to add the title page picture, and then add the bibliographical info on the page I mentioned above. To be more specific: How do I post a picture on the Bible_wiki album, so I can reference it in the text entry? I have the picture uploaded to my own album on flickr so far. The old Bible book in the digital age sometimes matures strange fruits and these fruits produce even stranger results. It's known for quite some time that universities and renowned libraries digitize even Bibles which at times can be a windfall for collectors to load them on e-book readers or tablets. 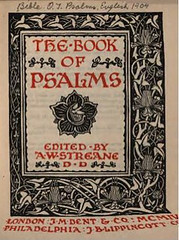 Such a lucky chance proved to be a Psalm book from the early 20th century translated by Kaufman Kohler and published by the Jewish Publication Society. Archive.org had it digitized and I loaded it down - just to find out, after some doubts had grown, that an anonymous KJV text had been digitized instead by mistake. Frustration lasted until unexpectedly this Kohler- title was being offered as a physical book by a Publisher (ReInk Books) from India as a reprint item. Without hesitating I ordered this paperback for a reasonable price (€ 22.-, or c. $ 30.-). 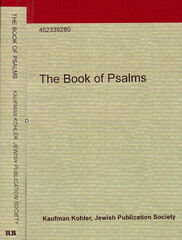 About three weeks later I opened the package - just to find out that the very anonymous KJV Psalms (Temple Bible) pdf-file, digitized by g000gle had been printed and wrapped in a Kohler- titled cover. Disappointed and disillusioned I was, you bet! 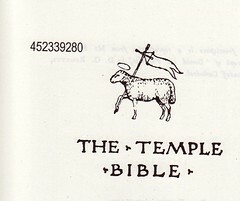 From left: ❶ Cover of "Kohler" Psalms Book; ❷ Inside: "The Temple Bible" KJV title with reprinter's book-ID; ❸ (coloured) title scanned from Archive.org; in this paperback it is reproduced in b&w. As I'm new to this biblewiki, I'd like to introduce myself to the forum: My name is Simon Birnbaum from near Karlsruhe, Germany. Since 1984 I collect Bibles in German, English, Hebrew and Greek. In 2008 I decided to put my collection in form of an archive into the Internet (www.bibelarchiv-birnbaum.de and, lately as a successor, www.bibelpedia.com). So I'm sharing quite the same passion as biblewiki does - just in some other form and with different accents. As my father presented to me an English New Testament already when I was a child, I got acquainted with this sort of literature from my early years on and later started collecting Bibles (also) in English. Earlier today I filled in the templates for two new entries: The 1870 copy of Henry Alford's NT and Fr. Lazarus' Holy Psalter from the Septuagint (1966). As I've never done this before, I hope the template-entries work. Scans of the these first two entries I've e-mailed to the webmaster. I was trying to find out information on a Bible I have. It is a pocket size new and old testament dated 1816. It says "American Bible Society Instituted In The Year 1816 New York". I was curious about if it is rare or was there a lot published in 1816? I was wondering if it was common back then to print the old and new testament pocket size? in discussion General Discussions / General Discussions » Concordances. I do not have much to contribute in this field, but would be willing to monitor input, help with pictures, etc. Hello call, I just joined this site as I really enjoy collecting old Bibles. But I have noticed that there are no listings for older Concordances. I own a few, including a 1635 copy of Clement Cotton's concordance which is, according to greatsite anyway, the first KJV concordance. I know these aren't as collectable but do you all think there should be a section at least for the older ones (Cotton's, Strong's, Cruden's, etc.)? I ask this because when doing research on the cotton's, I've found virtually no information, so maybe it would be nice to compile what info there is out there and maybe dig to find some more. I think something that most people using Ebay as a baseline aren't figuring is what amount do Bibles SELL for. It's one thing to ask an amount, another to get it. But people aren't looking at that. Look at English Hexaplas. right now there is one for $2500 and another for, get this, $4500. Are they insane? the last Hexapla I saw SELL on ebay was for $700. Granted it was an 1851 edition but still. Even the first edition rarely gets over $1500. But that's not stopping people from going higher. I think they see greatsite asking so much and figure they can too. I have what I believe is a second edition (based on info on this site, as mine has the 112 page intro and the "ornate" title page). I doubt it is worth more than $1000, and that's on a good day. Maybe I'm wrong but I promise you'll not find anyone who would pay $2500. I really think that ebay gets a lot of flack but some of the "professional" retail sites are as much to blame. They've inflated the prices because they view these Bibles solely as investment items. That's a shame as it keeps them out of the hands of a lot of people who really would have liked to have them. Now, mosst of the older Bibles simply sit on a shelf or worse in a safe instead of being read. I love the What's New page! I can see it is extra work, but it is a big help and much appreciated! Re: Links to electronic and hard copies? in discussion General Discussions / General Discussions » Links to electronic and hard copies? You might be interested to look at our new web site worldbibles.org which lists over 14,000 links to Bibles in 4,100 languages. These links include a wide variety of media formats. If you know of other Bibles that are not listed, and you'd like to add them to the site, please respond to the response form there. The site is completely non-commercial and simply indexes links to Bibles. A note should be put in to the DM Reprint section that states that the DM reprint is not likely to be found. With only 55 copies in existence, you are unlikely to find it. All of the works I'm adding currently are available as free downloads on The Internet Archive Digital Library When Microsoft LiveBooks Closed up, Microsoft released any restrictions they had on the scans done during their sponsorship, and the Internet archive has no restrictions on their works, so these works are now in the public domain. There are probably more works of scripture available on Google Books than on the Archive. However, the situation with the licensing of the works on google is not quite so clear. the works come with a plea to keep the works in a personal, noncommercial environment. I'm no lawyer so I can't say whether that allows for listing them on this (seemingly not-for-profit, but not clearly declared an IRS 5XX non-profit) or not. For works that are not in the public domain, (including public domain titles that have been scanned by commercial entities who are restricting the output of their scan,) linking directly to the download would not be wise. That is posting a link here that pops up a save-to-location dialog. Linking to the top level site (whatever.com with no /somethingelse appended to it) is definitely OK and linking to the highest level which shows the work (but also allows the scanning site to get in some ads or sales-pitch) would be unlikely to raise any hackles, since it would increase traffic for them. While Microsoft Live Book is gone, the Sources for most of the books that were part of Microsoft LiveBooks can still be viewed via The Internet Archive.